Dynamite have grasped the deepest plunging neckline in the industry with both hands and jumped headlong between the sheets with Elvira Mistress of The Dark. Elvira (Cassandra Peterson), for me, is one of the greatest things to come out of America in the last 35 years. As a business woman she’s just phenomenal. Ok, I cheated a little and employed a well-known search engine to verify a few of these but her credits include two television series, two movies (plus an IMAX movie), theme park rides, advertising for Pepsi & Coors, music albums, books, and has licensed over 400 products including action figures, jewellery, a clothes line, a wine label, and a range of perfumes. And, if all that wasn’t enough, she currently has the title of having the best-selling female costume of all time. The first issue of this new Dynamite series sees Elvira literally thrown through time by an unseen assailant and into a weekend getaway in Geneva in the company of Mary Wollstonecraft, Lord Byron, Percy Shelley & John Polidori. At this point things get strange… What follows is an entertaining B-Movie monster romp that sets up what promises to be a fantastic trip through some of literature’s greatest monster stories. Having been a fan for most of my life, I was thrilled to hear that a new comic series was coming out and that Elvira herself would have a large input in its creation. Dynamite has chosen David Avallone (The Shadow, Doc Savage: Ring Of Fire, Betty Page) to write for this four-part miniseries. 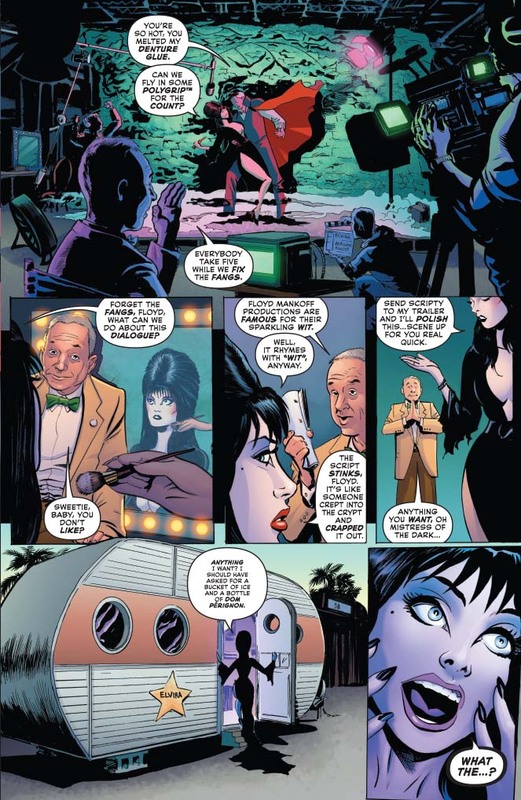 If you can drag yourself away from Elvira’s cleavage long enough to read the dialogue, you’ll find it’s extremely funny, full of double entendre and repeated smashing of the fourth wall. Elvira is not just a caricature bimbo in overly revealing clothes, she’s smart, sassy, and super confident and lord help you if you underestimate her. There are some genuine laugh out loud moments in this issue, I was going to put some quotes in but realised that I’d just be copying out whole chunks of the book because there’s so many. Dave Avallone is clearly enjoying himself in this first issue and hopefully he’ll keep up this enthusiasm for the next 3 issues. Dave Acosta (Twilight Zone, The Shadow, Doc Savage: Ring Of Fire) does a great job of the artwork in this first issue and between his art and Andrew Covalt’s colours they capture a combination of the early EC horror comics the classic universal movies, and dare I say just a touch of Walt Peregoy which really compliments the tone of the story. Overall, this isn’t a comic that’s trying too hard to be something it isn’t, like some other similar titles I’ve seen of late (Dynamite’s recent Vampirella offering, for example). It’s very self-aware and as long as you go into it knowing that it’s deliberately intending to be a B-movie horror-comedy then I think you’ll have a lot of fun. Based on this first issue, I’m really hoping that we get more of these stories because I don’t think I’m going to be satisfied with just four issues. I’m totally going to pick this up!